Space Shuttle Endeavour is currently on its way from Edwards Air Force Base in California to the Kennedy Space Center in Florida. It made a pit stop for fuel in Texas and will complete its journey to Florida tomorrow or Friday. It's relatively rare to see the Shuttle riding on top of NASA's modified 747. 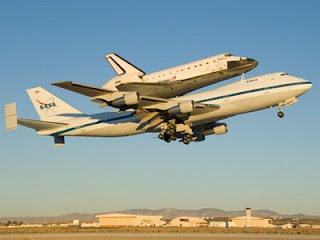 Ever since I received a toy Shuttle and 747 when I was about 5 years old, I've been fascinated by this feat of aviation. Below is a picture of that very toy (which I keep in my office) and Endeavour's most recent hitchhike on the 747. Below is a video of Endeavour and the 747 showing off for the folks at Ellington Field on its way to Florida. NASA's T-38 plane is also there in some scenes escorting the pair. More great photos from this episode are at PlasmaBen's website.